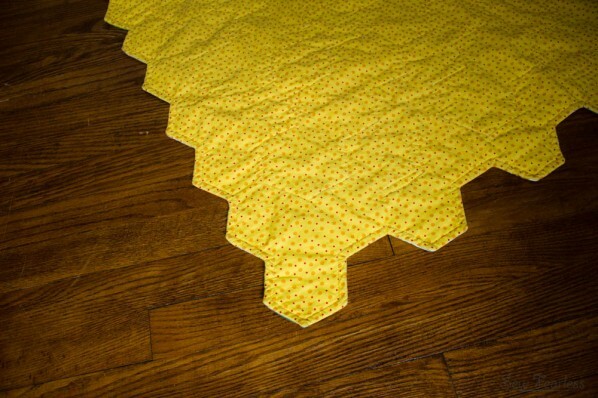 I made this English paper pieced hexagon quilt for my fifth-born child’s first birthday. 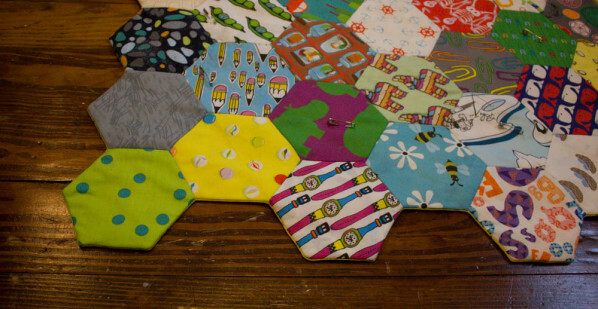 If I had more time, I would finished off the quilt edge by making a hexagon facing (see Bad Skirt for her drool worthy tutorial). However, his birthday was looming close and I needed a quicker method for finishing it off, but still keeping the wonderful jagged edges. 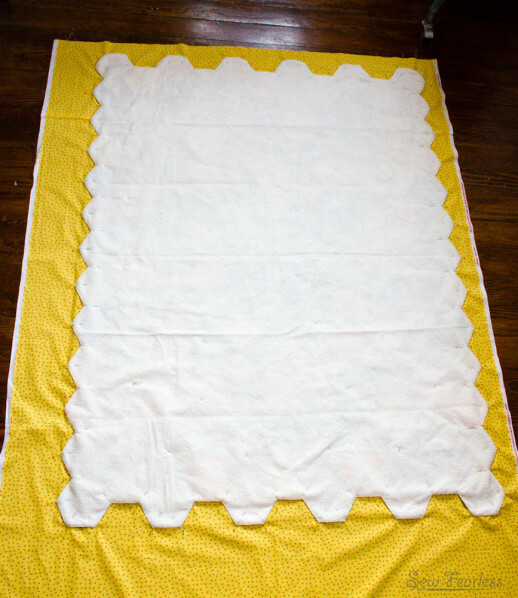 So, instead, I mashed up Red Pepper Quilts “A Quilt Without Binding” method and the facing method from Going Home To Roost’s Honey Pot Quilt pattern. 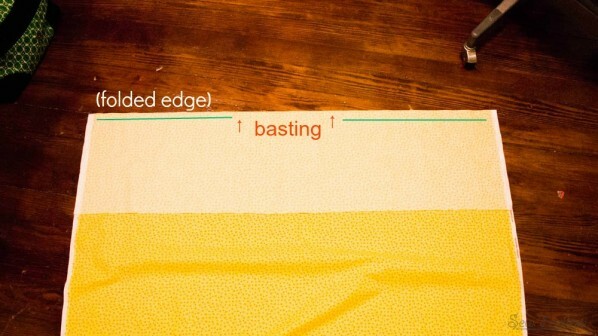 I’m no quilting expert, but this method should work for any shaped edge English Paper Pieced quilt.For The Sake Of Science, I’ll share my method here. 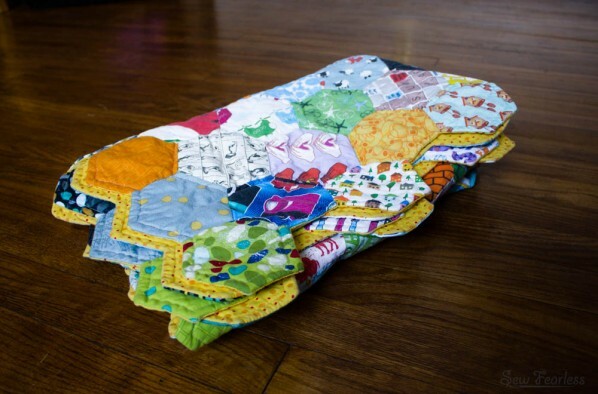 As we being the quilting process, remove all papers from the quilt top, except along the outer edge. 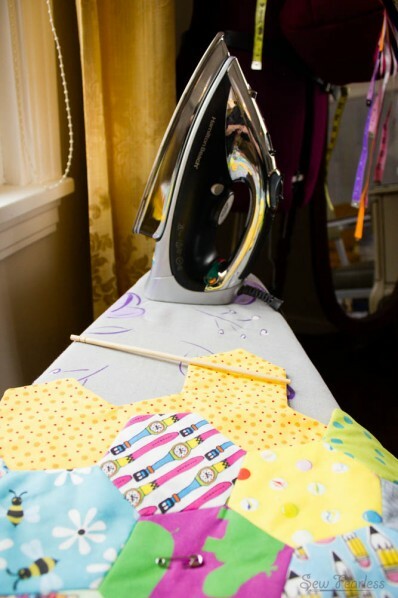 Press the quilt top, make sure the folded edges are nice and crisp. 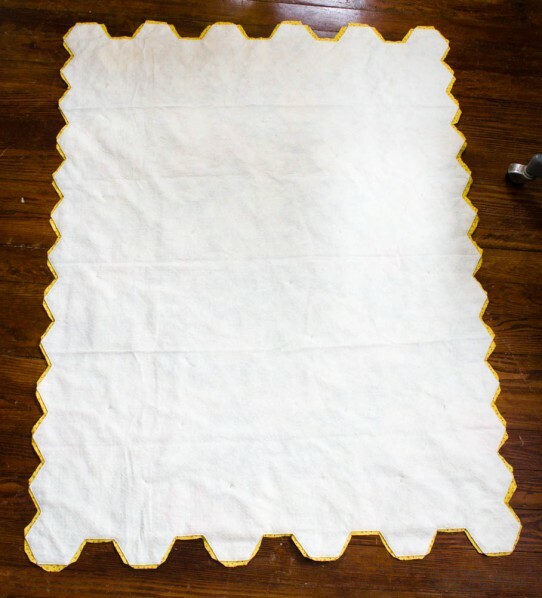 Lay the quilt top on top of the batting. Pin-baste the quilt top in place. Carefully remove the remaining papers from the outer edge pieces, (straight) pinning the folded edges to the batting as you go. Baste stitch the edge of the quilt top to the batting as close to the folded edge as you can, think 1/8″ or even less if manageable. Once basted, trim the batting down to the edge of the quilt top. Don’t cut the quilt top! To prepare the quilt back, we need to add a seam for turning. Fold the quilt back about 12 inches from the edge, right sides facing. 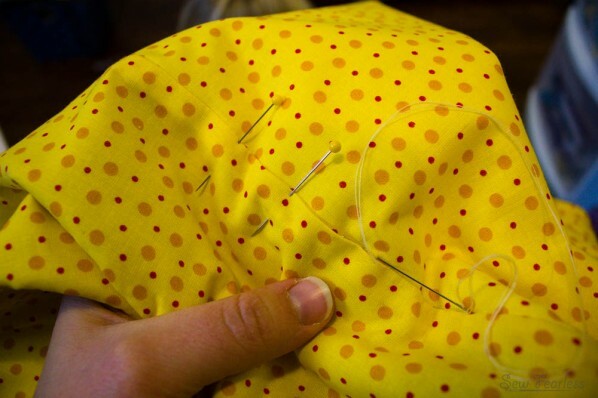 Sew a 1/2 inch seam, except switch to a basting stitch for about 12 inches in the center of the seam. After stitching, slight the fabric along the fold. 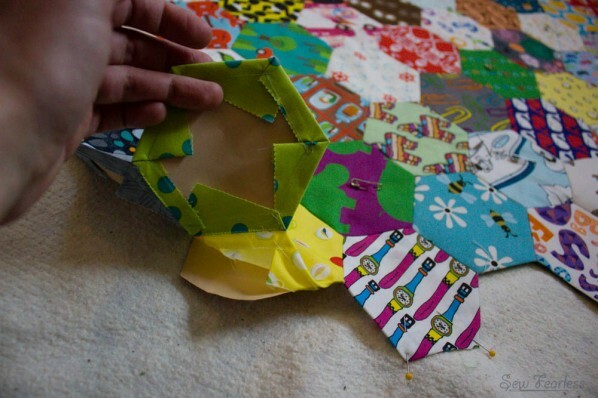 Unfold the quilt back open again, and press the seam to the side. Lay the quilt top (and batting) on top of the quilt backing right sides facing. Pin the edges in place. Sew the quilt top and back together, 1/8 inch from the quilt top’s folded edge, all the way around the quilt. Trim the quilt backing down to about 1/4 inch from the seam sewn. 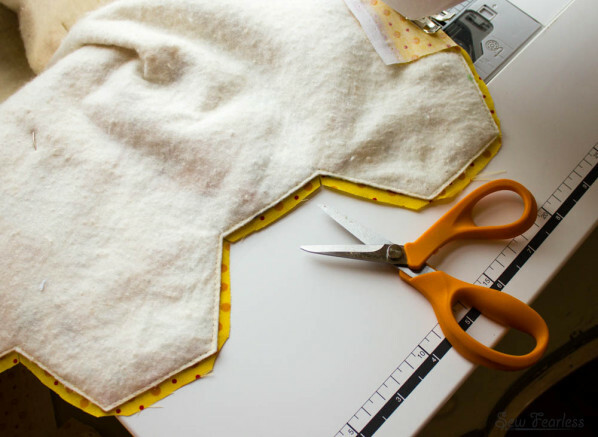 Also, trim the backing at the outer corners and clip its inner corners. Open up the basting stitches on the backing seam. Turn the quilt right sides out through this opening. Poke out all of the corners using a point turner and press the edges neat. 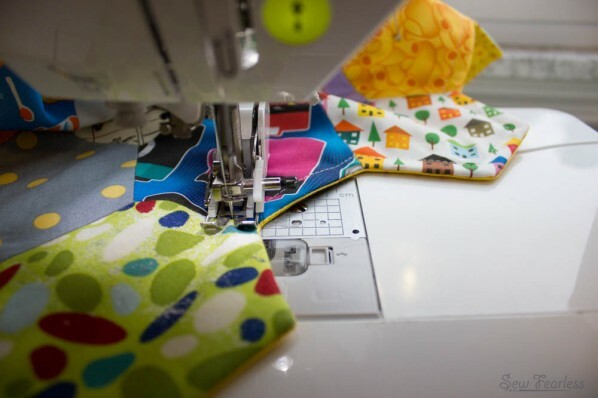 Slip stitch or ladder stitch the opening closed. Pin baste all three layers together.Then, start your quilting by top stitching the quilt edge (1/4 inch from edge), then continue to quilt as desired. Beautiful! I absolutely love the finishing. 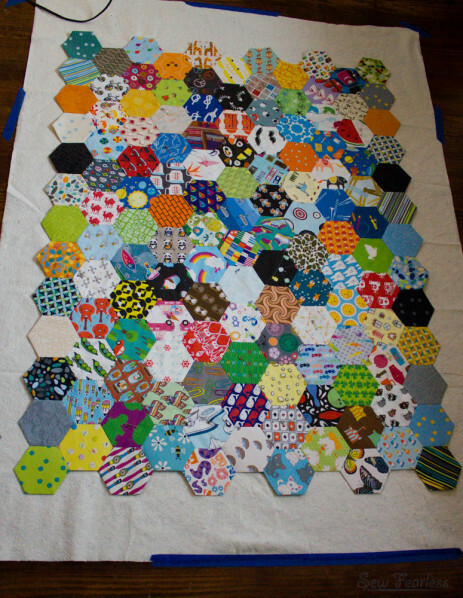 My hexie quilt has been waiting unfinished because I needed a finish without a binding for the shaped edge. Thank you for solving my problem. Your directions are pictures are great. I LOOOOOVE IT! So much time and love — soooo amazing. So exciting to see it finished! 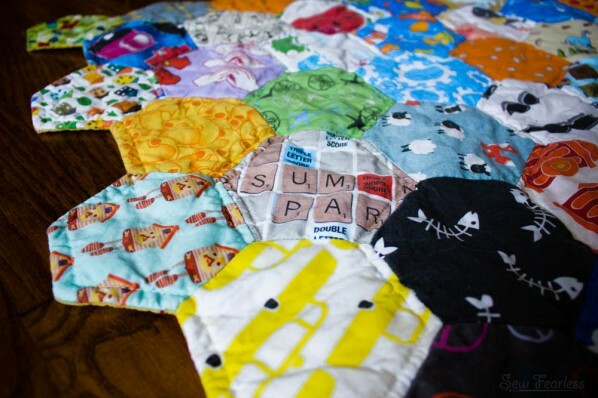 That quilt is amazing! It’s very inspiring that you managed to handmake something so beautiful and special for your FIFTH born. I love it. well.. i might not be taking copious notes on when he achieves his milestones, but he has a quilt, darnit! 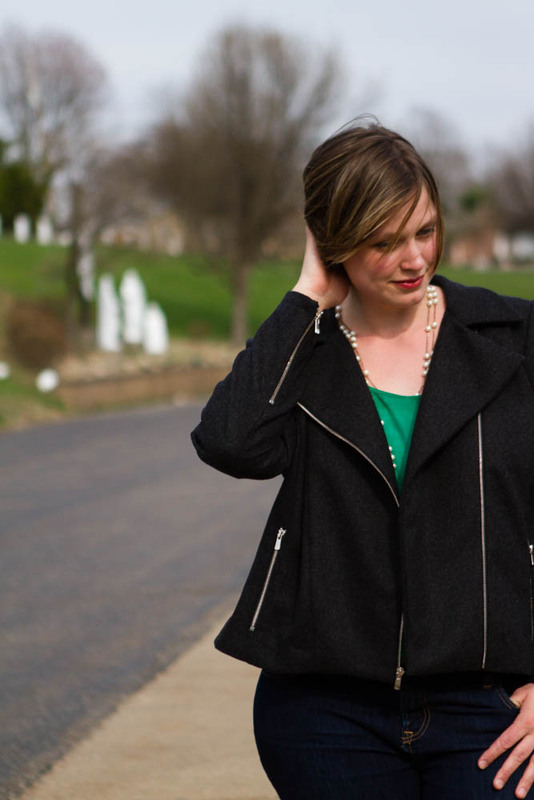 Binding is my mortal enemy, so I think is this a *great* idea! 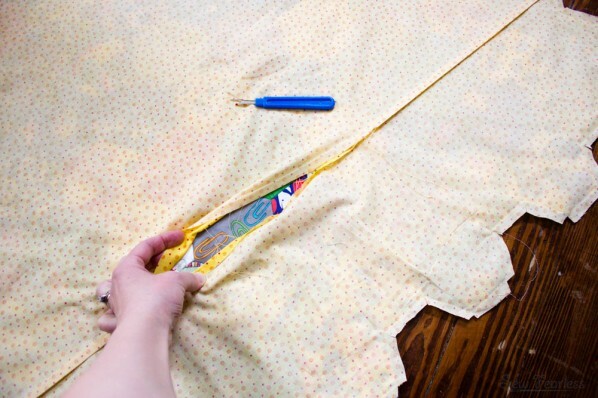 But I have one question — when you rip open the basting stitches in the back to turn the quilt, are you also slitting the fabric open then, or do you do that when sewing that 1/2 inch seam in the backing before sewing it to the top? oh, good catch. I forgot that step, and I’ve updated it. Slit open the fabric along the fold after basting. So helpful! 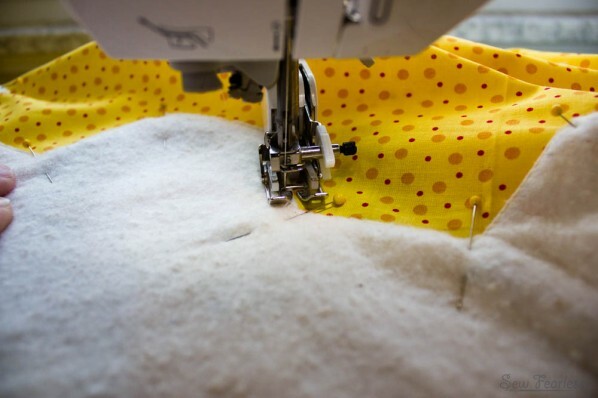 What did you mean when you say to slight the fabric along the fold? Instead of using two pieces of fabric for the back, I used one. 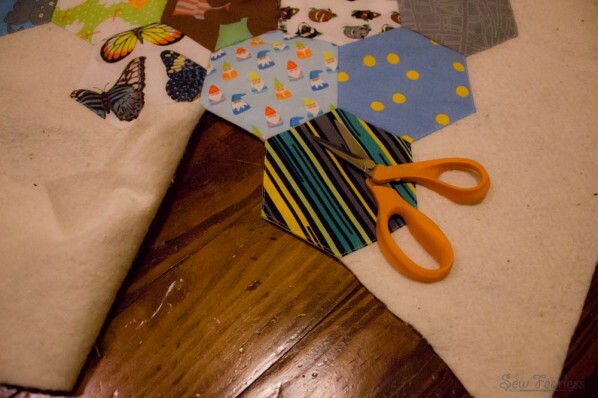 You need to create an opening in the backing for turning the quilt right side out. 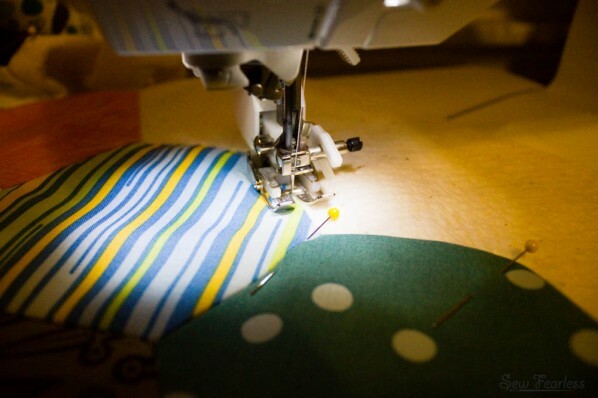 The seam that was sewn along the fold needs to be cut open for the turning. thank you thank you…I have been losing sleep over how to do this!!! Your photography and directions are complementary and concise. 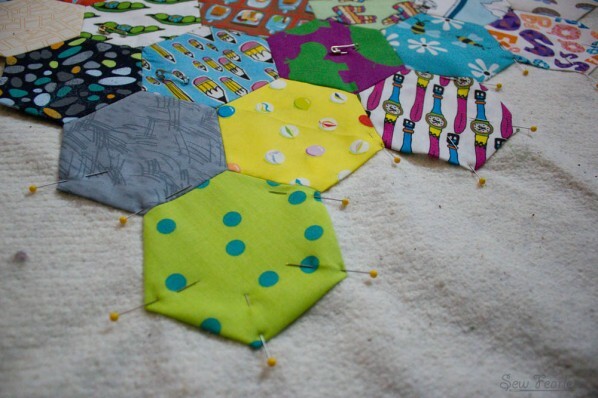 I will finally finish my hexagon. Thank you! I am going to use this to finish a hand pieced quilt top I made 40 years ago! Thank you. Wow! A lot of work went into this quilt as well as the backing binding combo. Beautiful work.